Suncoast Marketing, Inc. can now design your mobile app and assist you in marketing so you can get your business in your customers’ smart phones! Our apps are affordable, feature rich, and innovative! 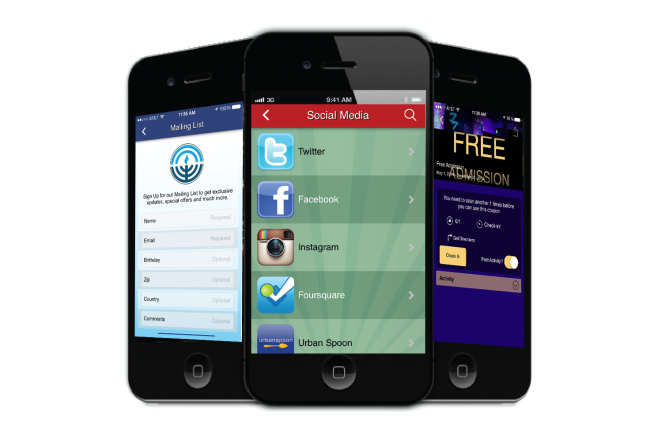 Having an app will help you build loyalty, brand your business, and much more! Digital marketing, digital advertising and branding are the future; smart phones make up 70% of the cell phone marketing today and that number is growing. Our Content Management System along with their design team enables us to customize, design and program functionality to your app. The dashboard feature makes it easy for you to manage content, loyalty, push notifications and geo-fencing—all managed from your iPhone! Our servers are hosted in the cloud and are redundant, using the latest technology to keep your app running constantly. Our data centers use the latest in data encryption technology, and data backups are performed daily, weekly, and monthly to ensure that your data is never lost while using our apps. Eye popping graphics, backgrounds, cool buttons, custom phone icons and more make your app look great! We can help you easily let customers know that you now have an app by posting on social media, using QR codes on receipts and business cards, and using print ready art!